We are delighted to be included in The Washington Post columnist Petula Dvorak's piece about #GivingTuesday. Join the AFTA cause by making a gift today! It will support our skilled and trained professional teaching artists who uplift the lives and improve the health of older adults living with physical and cognitive health vulnerabilities. Our celebrated artistic faculty lead therapeutic and multidisciplinary arts engagement programs in 31 community and residential care settings in Greater Washington, this year impacting 1,000+ seniors in the region with weekly and bi-weekly activations. Help us ensure underserved senior communities have continued access to the transformative power of regular arts participation. Donations will be matched dollar for dollar by The Morris and Gwendolyn Cafritz Foundation for up to $15,000! On November 13, under the gracious patronage of His Excellency Martin Dahinden and Mrs. Anita Dahinden, Arts for the Aging exhibited artwork inspired by The Phillips Collection exhibition, Ten Americans: After Paul Klee, and created by participants in AFTA workshops at five of the 31 community and residential care settings we serve: Alexandria Adult Day Services Center, Alexandria, VA; Arlington Adult Day Services Center, Arlington, VA; Downtown Clusters Geriatric Day Center, Washington, D.C.; The Morris & Gwendolyn Cafritz Adult Day Services Center/Easterseals of Silver Spring, MD; East County Community Center, Silver Spring, MD; Sacred Heart Home, Hyattsville, MD; Town Center - Housing Opportunities Commission (HOC) and Montgomery residence of Rockville, MD. 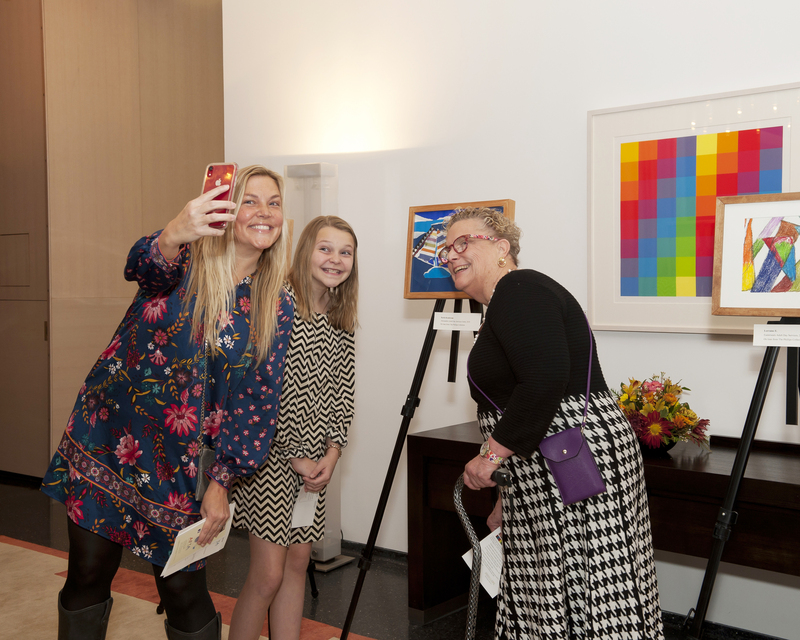 AFTA's artistic faculty, along with older adult participants with works featured in the exhibition spoke from the heart about the joy of self-expression and new friendships made through AFTA programs. Karla Kombrink talked about the renewed sense of purpose that she never had before; how she looks forward to the arts participation we offer because it combats the loneliness many older adults feels as they become less agile or mobile in the aging process. Photos from the night can be found here. Iona Senior Services welcomed AFTA teaching artists-in-training Chris Brown and Manny Arciniega to lead a program called, "The Rhythms of Life," which features musical technology and themes new to AFTA programming. Chris and Manny began the program by playing for Iona's older adults as they walked into the room to join; Chris strummed a melody on the bass while Manny accompanied on percussion. To formally begin the program, Chris and Manny played Norah Jones' "Don't Know Why." The room swayed side to side and seniors clapped their hands to the beat of Chris' slow-jazz bass performance. The program focused on rhythm and layering 'loops' to create textured music. To illustrate this, Manny assigned participants different movements and instruments to play at certain parts of a song. First, the participants practiced making a rhythm using motions with their hands and arms, such as moving them up and side, patting their stomachs, and even flapping like a bird, as suggested by a participant. Later, Manny passed percussion instruments, including the maracas and the tambourine, throughout the room to be played in harmony with one another. The participants were split into sections, where one group would play their instrument first while another group would play right after them. Manny's instruction led to the room playing in a loop, making a continuous rhythm that repeated itself. Chris demonstrated a similar 'loop' by recording a bass line for the audience and playing over the recording to add new elements to it. The final product resulted in a beautifully synchronized percussive accompaniment to Chris' bass line to Stevie Wonder's "Isn't She Lovely." Chris and Manny concluded their day at Iona Senior Services by playing "Happy Birthday" to celebrate a participant's special day. The room sang along together, applauding Chris and Manny's musical performance and program as it came to an end. We're excited to offer this stimulating new music program to our partners this fall. AFTA Teaching Artist (TA) Anthony Hyatt invited guests from India to experience two AFTA workshops. One of the guests, Neelima Pandit, is a traditional Kathak dancer. In an interactive workshop with Quicksilver at Iona Senior Services, Neelima demonstrated Bharatnatyam dance. The Quicksilver dancers borrowed from her movements and gestures in their own improvised dance. Later that week Neelima danced for participants at the Asian and Pacific Islander Senior Center in Washington, D.C. She danced the story of Ganesh and performed the kuma, a dance in circles. The Silver Singers, a dance and music performance group founded by Hyatt at the center, embraced Neelima and were eager to join her in dance. With no shared language, the dancers passed movement back and forth in a beautiful conversation accompanied by Anthony’s live music. Afterward Neelima shared that she was impressed by the AFTA teaching artists she observed, noting that few artists are so aware of and responsive to their audience members. Watch Neelima share joyful movement with Chinese seniors at the center. Neelima's guru in India, Mrs. Sharadini Gole, is still performing and teaching dance at 85 years old.